1. My favorite and most used tools this year are the needle tool, ribbon tool and slab roller. I know it sounds dramatic but I couldn't of made it through the class without the needle tool. I've used it to cut clay, score and slip, add detail and even poke holes in my parachute. The ribbon tool has saved many of my projects from turning out lumpy and lopsided. It's used to shave away clay which was very useful for the sgraffito tray. 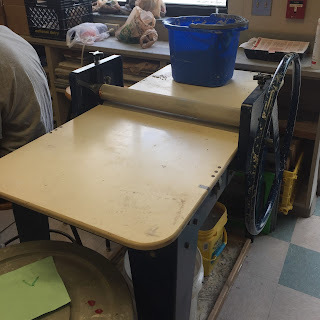 The slab roller made every clay project so much easier and less time consuming. It is used to flatten the clay out to an even thickness. This tool also saved my projects from being lumpy and lopsided. 2. Before this semester I don't really remember using any of these tools. The slab roller was the scariest to try out because it looked pretty complicated but in actuality it's easy to get the hang of. All you need to know is which way to turn the wheel and where the clay and cloth goes. After using the slab roller a few times I can now help others figure out how to work it. The needle tool and ribbon tool were easy to use and I have gotten better at using them for both their intended uses and more creative uses. 3. What is a technique you used in your artwork that worked well? Explain what technique it was and why it was successful. Pit firing my pot was the coolest technique I used this semester. This technique uses other materials such as pencil shavings, grass and wire to create unique patterns and colors on pots. To do this you cover the pots in materials and wrap it in foil and then pots are placed in a hole or pit in the ground, covered with more combustible objects and burned. When I got my pot back it had such an original placement of browns and blacks. It almost looked like it was an ancient artifact. 4. Describe a project where the choices you made regarding material, size, technique, etc helped enhance this project. My vessel piece was probably my favorite out of all the pieces I made this year. A few of the choices I made while creating the piece are what made it turn out so well. The first choice was with how I sculpted the body of the fox. I made the head, ears, body, tail and legs separate and then stuck them all together instead of sculpting it all at once out of one piece of clay. This made the body shape look more realistic and 3-D. 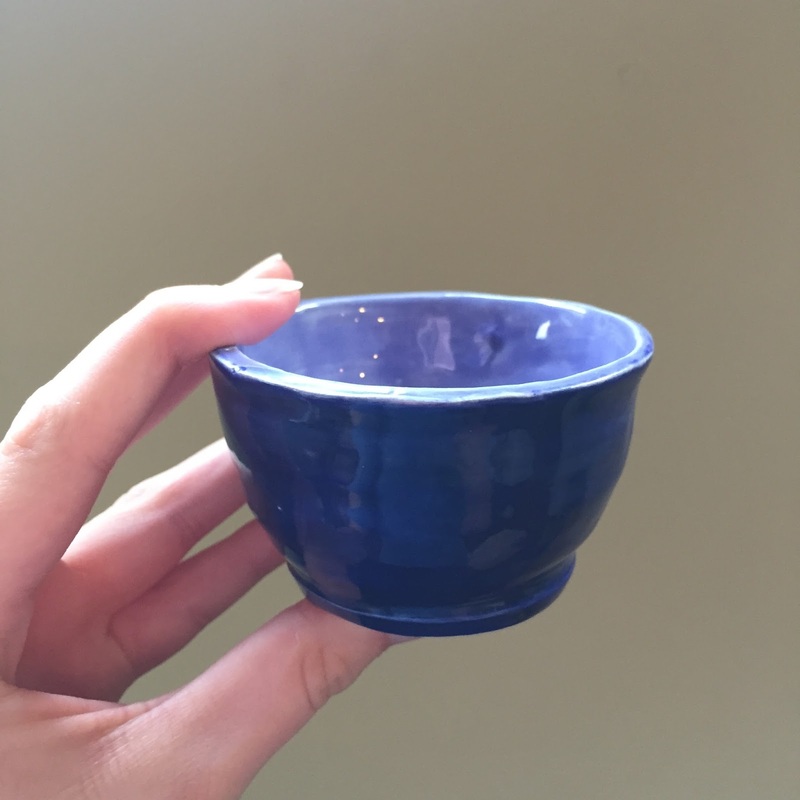 The size of the body and the hole inside is perfect to hold a small plant or anything really. Another choice that made the piece so unique was layering the glazes. 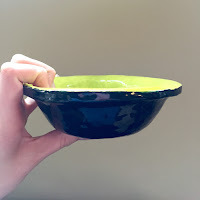 Although I wasn't fond of how the streakiness of the layered glazes looked, I got a lot of compliments on the color and how cool it looked. 5. What was your favorite material that you used this year? Why do you like working with it? My favorite material that I worked with this year is definitely clay. Your options are endless with clay. There are so many different things you can make with clay and so many different ways to make them. 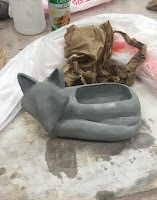 I made bowls 3 different ways this year and I even got to sculpt my favorite animal! Another reason I'm so fond of clay is because of how forgiving it is. As long as it's wet you can re-sculpt something as many times as you need because it's so easy to mold.